Re: Is "rush hour" declining? S.F.-based KCBS (AM 740) radio in my home region has been discussing this very issue over the past week, with the consensus being that on many of the area freeways (I-80, I-580, I-880, and US 101 being singled out) the congestion has indeed spread to midday, with the resultant backup starting around 5-5:30 a.m. and continuing until at least 7:30-8 p.m. M-F. I would concur, as just in the past couple of weeks I've had the need to utilize many of these (and other) freeways, and have seen a consistent pattern of a couple of miles of relatively free (45-50 mph and up) travel interspersed with stop-and-go segments on at least I-880 and I-580; I've pretty much given up on US 101 from CA 87 north to Palo Alto during daytime hours during the week (and my alternate, Central Expressway, is seeing increasingly more of the overflow). And Sunday we went south on US 101 to visit friends in Hollister (late afternoon SB); the NB direction was congested to stop-and-go level from CA 85 all the way down to CA 25, where we got off 101. It cleared out by the time we returned between 8 and 9 p.m., with only a slight glitch because of a "fender-bender" in Morgan Hill. So even weekends aren't immune from the problems -- in this case, likely folks returning from weekend jaunts to both the Monterey Peninsula and Gilroy (it's garlic-harvest time around there). Just another week in Northern California's Traffic Central! Try Solano County on the weekends we sometimes have I-80 jammed on both directions due to tour buses from San Francisco and Sacramento using I-80 either to go to Napa or Bay Area Tour buses going to Sacramento, Lake Tahoe, Reno and Downtown Davis for various events in those areas. Or Sacramento area buses using I-80 west to San Francisco. I even heard of I-205 mentioned as a bay area freeway too in some reports even though its technically in the San Joaquin Valley. Wow -- I think this is the first time I've heard of congestion attributed to large amounts of tour buses going back & forth along a stretch of highway! I know there must be some Napa Valley tour lines originating in the Sacramento area -- but it would be something of a stretch to imagine that those would in and of themselves result in congestion (unless a number of them were caravanning at slow speeds and "hogging" one of the lanes -- which I have personally witnessed over Donner Summit). Nevertheless, I do agree with Bing's assessment of the overall increase of traffic along I-80 in Solano County; quite a bit of housing has been built around the perimeter of Travis AFB, and one could safely assume that the pricing of such is considerably less than the Bay Area median. And areas like Vacaville can do, as mentioned previously, "double duty" as exurbs of both the Bay and Sacramento. Except for the Yolo Bypass (and whatever zoning regulations that come into play), there's little to prevent Fairfield from merging with Vacaville (around the south side of the hills), and eventually Vacaville merging with Dixon (which is also experiencing heavy growth), and then on to the edges of Davis (which might be a bit reluctant to massively increase its own housing stock due to the influence of UCD). I'm guessing -- with a bit of a heavy heart -- that one will be able to see housing stock adjacent to or near any point along I-80 from Davis to west of Vacaville by 2030 at the latest. As an adjunct to such development, the Amtrak Capitol Corridor service along the UP line to the south might establish a station stop at Dixon or even Elmira to serve the commuting population (that'd help the situation -- but if history is correct, only marginally). Well really its not just tour buses as the scapegoat but I see lots of tour buses and trucks in Solano County due to I-80 being a major interstate for both Sacramento and San Francisco two distinct census designations though. It's a factor but not the only ones though. But there has to be places in other parts of the country where they have similar conditions to Solano county, CA though where they have to provide "affordable housing" to two or more distinct designated census areas though because the centers are expensive though. Temecula down in Riverside County came of age in the '90's as an affordable exurb to both San Diego and greater L.A. (specifically the "Inland Empire"), particularly after I-15 was completed between there and Escondido. However, its emergence as a tourist destination as the heart of SoCal's "wine country" resulted in very rapid gentrification; its place as an affordable midpoint was assumed by the adjoining city of Murietta to the immediate north (at the 15/215 split); while housing prices there are certainly not cheap by any means, they are considerably less than closer-in (to L.A.) cities like Corona or Chino Hills, so it still attracts commuters seeking relatively reasonably-priced homes -- and is still growing (to the northeast, toward Hemet). In SoCal, that's the closest area that I can think of that would rival Solano County as a housing adjunct to two separate metro areas. BTW, development of the area just to the south of Temecula -- toward San Diego -- would be difficult because of the terrain (rocky hills comprising the ridge connecting the coastal range to the Palomar range to the east). Wow I heard of Temecula before and that's been mentioned where people make gas stops before people in SoCal head out to the Casinos in the area like Morongo and others. Never knew that it has a similar situation to Fairfield, Suisun city and Vacaville where they have to provide housing to two distinct census statistical areas. The better-known casinos are out on I-10; Morongo is a couple of exits prior to the CA 111/Palm Springs exit (EB), while the others are in and around Palm Springs and farther east between Indio and Coachella. Temecula is south on I-15; there is a casino south of there along CA 79, and yet another east of I-15 on CA 76. But the build-out of the City of Temecula occurred prior to the casino's establishment; there were isolated Native American tribal regions scattered around the region, and the casinos were sited at the most accessible locations within those regions. The last time I drove on I-15 through Temecula (circa 2014) the freeway, fully 10 lanes wide in the section shared with CA 79, was congested in both directions (this was about 4 p.m); this is a normal weekday occurrence, as there are cross-streams of traffic to both Temecula and adjoining Murrieta, with some traffic originating in San Diego County heading toward residences in Murrieta, and traffic originating in greater L.A. intended for Temecula, to the south. And it's likely to worsen as more housing is built in the outlying areas to the north and east of these cities. Are there any areas or suburbs that would be worse to commute to than downtown? I personally think commuting to Henrietta (from any origin except south of the thruway) would be worse than going to downtown Rochester. Way more congestion, especially on I-590 and I-390. I-80 halfway from Vacaville and UC Davis does get jammed on both directions mainly because lots of Sacramento and Bay Area people go to Dixon,CA for gas stops before reaching their intended places on either side. When L.A. and the OC are increasingly pedestrian, bicycling and bus oriented (these are the most car-centered cities on earth), you really need a car in the further ring (40-90 miles from civic center LA and downtown Anaheim) of suburbia in So CA. The beach cities or 5 miles from the ocean aren't likely to drive 1 mile to or from anywhere, like Santa Barbara or San Diego. But the need to drive or possess an automobile is the greatest in Riverside, San Bernardino, Palm Springs and Victorville. it's common to drive 5, 10 and 20 miles for necessities, and the constant commute to workplace businesses within LA county or the coasts indicate the need for offices closer to newly build homes. Well that's also true in Downtown Sacramento and Downtown Davis they are also becoming pedestrian, bike and Public transit friendly like the Bay Area. Well the people who are most dependent on cars would be the place I mentioned earlier in this thread for pretty obvious reasons and I happen to be one of them. I remember Highway 401 or "The 401" has the busiest freeway in Canada though. That's because it's 18 lanes. You can't have more than a certain number of vehicles per hour per lane (usually about 2200, but it's not quite a hard cap), so to increase AADT, it's mostly about how many lanes there are. Relatively constant amounts of traffic can also help (the limit is per hour, not per day), but I'm not sure how well ON 401 compares to other freeways in this regard. Back in the late 80's and into 1990, it was possible to drive on the expressways in Chicago between 9am and 2pm and not hit a signifigant slow down. I did just that during the fall of 1990 when I worked for a leasing company. If your vehicle had service due (oil change for example) we would come to your house/job or whatever to pick up your car and bring it to the dealership for its service, and drop it back off to you. We had customers all over Chicagoland. After about 2 to 2:30 in the afternoon all bets were off as the toll plazas (especially on the Tri-State) would begin to back up signifcantly, and by 3pm the Ike or Kennedy would be a parking lot. The friends I still have back home tell me rush hour around Chicago is now pretty much 24-7. Its funny, because even in my relatively rural town that live in now we have a rush hour, which normally lasts from 6-8 in the morning and 5-7 in the evening. Most of it is caused by MCAS Cherry Point traffic to and from Havelock. It gets really bad on Friday evenings during the summer as it seems like the entire population of City of Raliegh and its suburbs flows down US-70 like a river after a dam failure, all trying to get to the beach. My family calls it rush morning, rush afternoon, and the weekend rush because Portland traffic has gotten really bad (but still partially fixable). Here is what traffic is like driving the main thoroughfare of Detroit on a Saturday afternoon. It's quicker to take Woodward downtown than hopping on the freeway (at least until you hit the Davison). Damn, I love MDOT's signaling along the boulevards. Other states should take note and repeat. It would be lovely, but I think the cross streets have to be evenly spaced for the timed signals to work out. I would love to see MDOT-style boulevards in my neck of the woods, but there's never enough ROW to accommodate the required width. Yes, as you say not enough ROW and cross-streets are unevenly spaced as well. I hope for a parallel freeway bypassing Puyallup, South Hill, and Graham, but not holding my breath. As is so often the case, no one thinks about setting aside right of way for a freeway/boulevard until it's no longer cheap and easy. Detroit is one region that set aside ROW for future expansion. 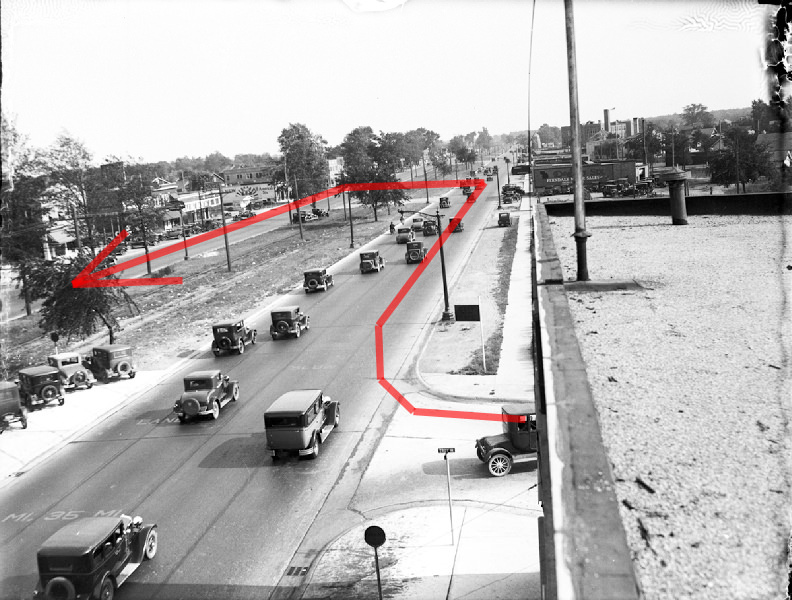 Back in 1926 the Rapid Transit Commission proposed a Super-Highway Plan for Greater Detroit that identified 217 miles of roadway in the region that would extend outside of the city. These Super-Highways would have 204 feet ROWs and by the 1930s you literally had 8-lane boulevards cutting through farmlands 20 miles outside of Detroit. Although the first “Michigan left” wasn’t officially built until 1967, the concept has existed for some time now. Loons are a good middle ground, apart from setting the initial ROW wide enough to accommodate U-turns without building them (Detroit style) (also hindsight is 20/20), but they still require bumps in the ROW that might not exist. WA-161 (mentioned upthread) is a lost cause. There are too many buildings fronting the ROW for any widening to occur, even for loons. What isn't a lost cause is Canyon Road, a county-maintained road that parallels WA-161 from the 512 freeway to 200th St (a distance of about 5.75 miles). Canyon Road does not yet have the ROW issue. It's also a 4/6-lane road with median U-turns along the entire stretch, but left turns are still accommodated at signals. The problem with the U-turns is that they're all unsignalised single lane setups, incapable of handling a turn previously occupied by, say, a double left. And apart from only a couple intersections, there are no exclusive right turn lanes for those U-turners to divert to. The road could pretty easily be modified to support higher traffic counts, but, as is often the case in my area, almost certainly the ROW fronting the road will be sold to developers, and all hope of doing anything major with U-turns will be lost. Our only hope is PPLT's, and there's only one of those along Canyon (onto Fredrickson Industrial Park Road). As I've said on other threads, Detroit is a model for proper timing of arterials. And one key way to keep freeway traffic manageable is to have well designed and timed arterials. Keep the short distance traffic on the arterials so that the freeways can be less congested. In many other cities, driving arterials is maddeningly slow with the need to stop at almost every signal. This drives traffic to the expressways and causes rush hours to occur throughout the week, because even at 20 MPH it is still quicker to go out of your way to take the freeway. My own observations in DC, where I travel primarily along the Metro rail, morning rush hour tends to be easier than afternoon rush hour. T,W,Th mornings are heaviest with F being lightest by far. For afternoons F is worst, then Th, Tu and Wed are equivalent, Mon the easiest. F and M are the preferred telework days here and Th and F evenings tend to see getaway and entertainment traffic (going out for concerts, ballgames) more than M, T, W.
In reality all rush hours are bad here, but F morning is easiest. In most areas, morning rush hours are easier than afternoon due to drivers being tired from a heavy day of work among other reasons. The people out in the morning rush hour are pretty much just people who have to go to work in the morning. But the afternoon rush has people who went to work early who just got off, plus people working swing shift on their way to work, plus students and homebodies out doing errands. Tend to agree with this. It might also be relevant that school traffic does not overlap that much with rush hour traffic. And there are definitely more people overall on the roads in the afternoon. Roads that are free flowing outbound in the morning can often be slow in both directions in the evening. NY 590 and NY 104 are good examples of this. North and East are always free flowing during the morning rush. Conventional wisdom would then suggest that South and West should be free flowing in the evening. Not so much the case (although neither are "congested" by East Coast standards, they are distinctly busier than their morning counterparts, and a single left lane camper can create miles-long masses moving 50 mph or so). According to this article Rush Hour in Austin,TX is from these hours and they use the MoPac as their reference. Using those parameters, it shows Monday morning rush hour is slightly later between 7:15 and 9:15. Then Tuesday through Friday show similar rush hours between 6:45 and 9:15. Each day seemed to have a different time for a peak price during the rush hour, but the average appeared to be around 8:30. Friday, though, was around 8:00 a.m.
During the afternoon Monday northbound rush hour started slightly later between 4 and 6:40. Tuesday, Wednesday and Thursday stayed fairly similar showing rush hour times between 3:45 and 6:50. Friday starts earlier and ends earlier. It goes from 2:45 to 6:15. Good luck driving in any Seattle freeway anytime between 7 AM and 7 PM. Even weekends are bad. It really depends on the route you take and the day of the week, but I wouldn't say it's 24/7 everywhere. 294 between Lake County and O'Hare starts to back up by 3, but I think that's due to people traveling from offices in Lake County to catch flights. I can leave the Deerfield area at 4 and be in Rogers Park by 4:45. I-295 in NJ is all suburb-to-suburb commuting, with traffic delays of over 10 miles quite normal, varying between interchanges 23 & 40. Approaching US 1 (Exit 67) congestion is normally expected also, with no downtown within 30 miles. I realize I'm replying to a years-old post, but I would guess that the majority of I-295 traffic between 23 and 40 is Philadelphia-bound during rush hour. Now for *me* it's a suburb to suburb commute, but not the majority. As for US 1, Trenton doesn't have a downtown? Not really. Rush hour is especially heavy on 295 North from Exit 26 to Exit 36 with some congestion in the morning, and from Exit 40 to Exit 26 in the afternoon, with much of that traffic trying to get to Rt. 42 South. If they were trying to get to Philly, the opposite would be true. I've driven the entire length of the Grand Concourse in The Bronx without ever stopping because of benefitting from the synchronized signals.